Delivery and Shipment (updated daily) As of All orders are shipped within 2 days from order. 90% of all orders are shipped the very next day. If an urgent order, email us the request and we'll see what we can do. The actual delivery date will depend on the shipment method selected at checkout. For "Next Day Air' delivery, , please order before 9:00am CST to receive your order the very next day. For 2nd day shipping please order before 9:00 am.CST Wednesday. NOTICE: 2nd day shipping and Next Day Air, Does Not deliver on Saturdays or Sundays. All Second day orders placed after Wednesday at 10:00am CST will arrive the following Monday. Notice: Most orders ship within 48 hours of being placed. However, If because of high volume, we may delay in meeting that deadline. If your order is urgent please select "Next Day Air". NOTICE:Any Next Day order placed on Friday will not be delivered until the following Monday. Because of delays in Customs, delivery times are not available for out of country orders - including Canada. All International Orders may take several months depending on each country's postal system. For International orders, additional charges may apply. Please note that you are responsible for any and all foreign Customs Charges and/or Duties. We are unable to undervalue shipments for Customs purposes. All prices are in US Dollars. Please keep in mind we are a small family run company. Our top priority is always customer service. However, because of the volatile nature of internet sells, at times there may be a lag in responding to a customer's request. Please be assured, if this happens, your concerns are still our top priority! Feel free to contact us by phone or email. To insure faster response, however, contact us by email (rather than phone). Either way, be sure to include your name, customer and order number along with your concern (example: 'when did my order ship?'). We will respond to ALL customer inquiries as fast as possible. Because of a high volume of orders, at this time, phone orders are for specific vinyl lettering, decals, graphics, and sign items only. Special orders or custom design orders must be handled through initial email communications. Are you worried about the security of your credit card information? Sign Specialist takes every precaution to ensure all transactions are safe. The shopping cart system was selected because of its secure nature. In technical language, the shopping cart program is on a secured server using standard Internet PGP to encrypt information. This means that your information is turned into a secret code that outsiders do not have access to. 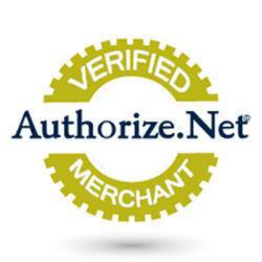 All online transactions are secured by Authorize.net. This means that even SignSpecialist.com and our employees do not have access to your credit card information. This is much safer even than giving your card to a waitress, gas station employee, or store clerk. Federal Law Protection Under the Fair Credit Billing Act protects all credit card purchases. In the unlikely event that your credit card information were stolen over the Internet or anywhere, your maximum liability is $50. If this happens during a transaction at Sign Specialist, and your credit card company holds you responsible for this amount ($50), Sign Specialist will give a credit for this amount. We hate spam. We are not in the bulk e-mailing business. Please give your e-mail address at checkout. This will allow us to verify any questions easily and quickly. Also, most of our customers are sent an automated e-mail when their package has shipped - if a valid e-mail is given. We will not e-mail you with 'sales' or 'promotional' flyers (no matter how good they are) unless you have specifically asked for such communication. You will only be contacted regarding your purchased item. And of course, your e-mail address in never 'shared' with anyone. All offers and prices are without obligation and are valid for information purposes only, so that they are not binding to us under any circumstances. Our prices are subject to change without notice. SignSpecialist.com will not be held liable for failure to execute an order due to exhaustion of stocks, non-execution of deliveries by the suppliers of SignSpecialist.com, the destruction of goods due to accidents, strikes, fires, floods, or any other defects that are caused by natural disturbance etc. This list is not exhaustive. SignSpecialist.com is not obliged to prove the unforeseen character of the circumstance which constitutes force majeure. All terms and conditions on this website govern all agreements between SignSpecialist.com and its customers, in so far as no departure from them is stipulated in special terms and conditions or agreements. Our general and special terms and conditions of sale and delivery are deemed to have been accepted by our customer even if they should be in conflict with his general or special terms and conditions. Any reproduction in part or whole of this site, without prior written permission by Sign Specialist is strictly prohibited. Sign Specialist has made reasonable effort not to reproduce any copyrighted images. If you see that there is such and image, please contact us, and we will remove it. All efforts to fraudently purchase and entrap or damage us in anyway by misuse of trademark or copyright laws to create financial gain, discredit our good name and standing in the market place, etc. is subject to civil and criminal liabilities. We at SignSpecialist.com accept gladly your patronage. SignSpecialist.com will not sell to anyone who has not conveyed to us that they are authorized to reproduce the registered trademark and thereby assume all legal responsibility and any purported damages for any trademark infringement resulting from their fraudulent misrepresentation. The showing of any layout or logo at SignSpecialist.com is for exhibition purposes only and does not signify or connote that any layout or logo may be reproduced without the approval of the owner of any trademark, copyright or other right in layout or logo. The adjuration of any order establishes a warranty and representation by the entity or individual adjurating the order that such entity or individual is the owner of all trademarks or copyrighted material contained therein or has obtained any required authorizations or allowance from the owner to duplicate given design or logo. The encumbrance of acquiring the applicable approval to duplicate designs that are a registered copyright or trademark lies completely with you and your company. You must obtain the applicable approval, if needed, before placing any order that intels copyrighted artwork or logos. By purchasing you are conveying to us that you have authority, or that you have obtained approval to reproduce the requested trademark or logos. SignSpecialist.com is created in such a way so no one can request custom work through an order without first conveying to us that they or their organization are authorized and assume all liability as to trademark laws for the product custom made to their specifications. In fact, the preset 'check box' displays: 'I do not have authority' and must be changed to: 'I do have authority' for an order to be processed. Sign Specialist policies are subject to change at any time. Be sure to check this page periodically for any changes. Warranty: Our 100 % Customer Satisfaction Gurantee! You can return any product for any reason involving malfunction, damage in shipping, or anything that was our fault. However, you must contact us to let us know of the problem. Our 100 percent Money Back Guarantee, on everything except signed contractual agreements and custom made products, is good for 30 days from delivery. If you are not satisfied because of malfunction, damage in shipping, or for anything that was our fault, return the product(s) for a full refund excluding original cost of shipping. All products must be in original condition with all packaging and accessories. We cannot exchange or refund products unless they are damaged or defective. If the product is defective on arrival, return the package to us for replacement. Please note: You must contact us to receive return approval BEFORE you return the package. We will not accept packages w/o authorization. You must return the package with all contents and enclosures that shipped with the product. You must return it in the protective box or other similar shipping carton as used to ship originally. Incomplete products are subject to restocking fees of from 10% to 50%. In cases of major damage or abuse, the product may be refused. For liability and security concerns, return credit can only be made to the original purchasing account. Shipping charges are NOT refundable.